On April 12 American tenor Bryan Hymel returns to his native New Orleans with his celebrated portrayal of Lieutenant Pinkerton in Puccini’s Madama Butterfly. Bryan’s New Orleans Opera performances will also see American soprano Maria Konyova as Cio-Cio San, mezzo-soprano Margaret Thompson as Suzuki, and bass-baritone Jake Gardner as Sharpless under the baton of conductor Tomer Zvulun. The performances come on the heels of a breakthrough winter for Bryan. Last month Bryan was named the recipient of the Metropolitan Opera’s Beverly Sills Award. He was also nominated for an Olivier Award for Outstanding Achievement in Opera for his performances in Les Troyens, Robert le diable, and Rusalka at London’s Royal Opera House. American tenor Bryan Hymel’s performances in Les Troyens, Robert le diable, and Rusalka at the Royal Opera House have been nominated for an Olivier Award for Outstanding Achievement in Opera. Bryan is the only singer to be honored in the category. Inaugurated in 1976, the Olivier Awards recognize achievement in British theatre. The nomination comes on the heels of Bryan’s winning the Beverly Sills Artist Award from the Metropolitan Opera earlier this week. Looking forward, the American tenor continues performances this season with highly anticipated debuts with the Salzburg Festival, Semperoper Dresden, and a return to Royal Opera, Covent Garden. Bryan Hymel has been named the recipient of the eighth annual Beverly Sills Artist Award for young singers at the Metropolitan Opera. The $50,000 award, the largest of its kind in the United States, is designated for extraordinarily gifted singers between the ages of 25 and 40 who have already appeared in featured solo roles at the Met. Bryan was presented with the award at the Met today by Muffy Greenough, daughter of Beverly Sills. The Sills Award was created to help further recipients’ careers, including funding for voice lessons, vocal coaching, language lessons, related travel costs, and other professional assistance. Sills, who died in 2007, was well known as a supporter and friend to developing young artists, and this award continues her legacy as an advocate for rising singers. 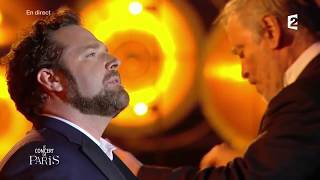 The 33-year-old American tenor is the eighth recipient of the award, following baritone Nathan Gunn in 2006, mezzo-soprano Joyce DiDonato in 2007, tenor Matthew Polenzani in 2008, bass John Relyea in 2009, soprano Susanna Phillips in 2010, mezzo-soprano Isabel Leonard in 2011, and soprano Angela Meade in 2012. Earlier this season Bryan made his Met debut, singing the demanding role of Aeneas in a rare revival of Berlioz’s epic Les Troyens. Bryan’s performances, which were also transmitted worldwide as part of the Met’s Live in HD series, were met with great acclaim from both critics and audiences alike. The New Orleans-born tenor will return to the Met in January 2014 to sing the role of Pinkerton in Puccini’s Madama Butterfly. Bryan Hymel will make his debut with the Pittsburgh Opera later this month, singing Lieutenant Pinkerton in Crystal Manich’s production of Puccini’s beloved opera Madama Butterfly. The American tenor stars opposite Italian soprano Maria Luigia Borsi, who plays the role of Cio-Cio San. Performances begin on March 16 and run through March 24. Click here to learn more about the production, including information on pre-concert talks and ticket sales.